For the majority of classic car owners, the battery is of little aesthetic consideration – it just needs to work. But to some, the general appearance of the battery has to be commensurate in looks with the age of the car. Today various companies produce a range of vintage and classic style batteries. However, one battery has yet to be reproduced – the famous Lucas ‘S’ battery . The Museum looks at the Lucas ‘S’ range of batteries, fitted to many Jensen cars during the 1960s and into the 1970s. Lucas produced their ‘S’ range of batteries from late 1953. This new innovative and patented design, had a striking one piece red plastic cap to the top of the battery, emblazoned with the LUCAS brand name. This single red plastic manifold top, meant the ‘S’ type battery was link-less (i.e. no exposed links between cells), which gave a very clean and modern look. No wonder Jensen Motors took the new Lucas battery on board. To date it hasn’t been possible to define exactly when Jensen Motors started using the Lucas ‘S’ type battery, or indeed when they stopped. Photographic evidence so far shows that Jensen Motors were using the ‘S’ type battery between 1966 and just into the 1970s, although it is possible they were using them before and after these dates. 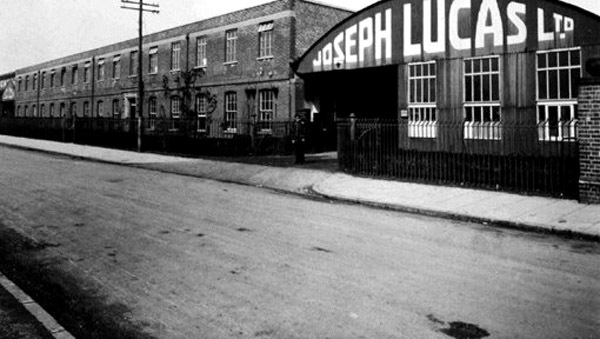 The Lucas Birmingham works. Photograph taken late 1950s / early 1960s. 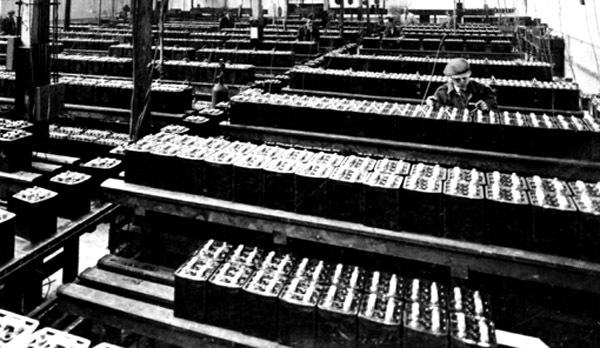 The inside of the Birmingham works with battery production in full swing. Photograph taken late 1950s / early 1960s. 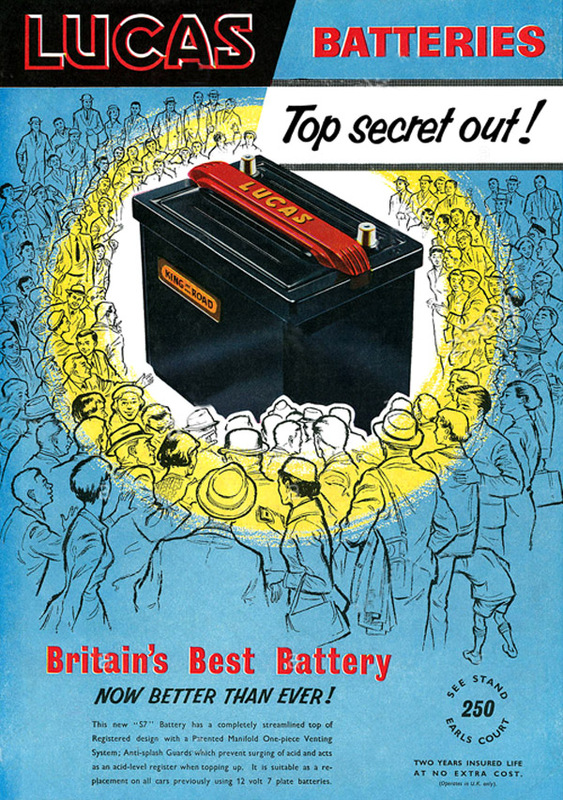 A Lucas advert from the 1950s for their ‘S’ type battery. 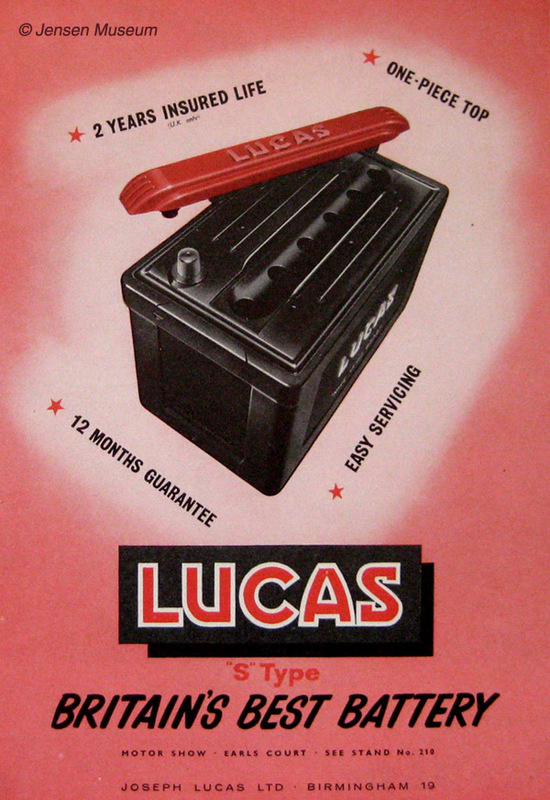 Lucas ‘S’ type battery advert from 1958. 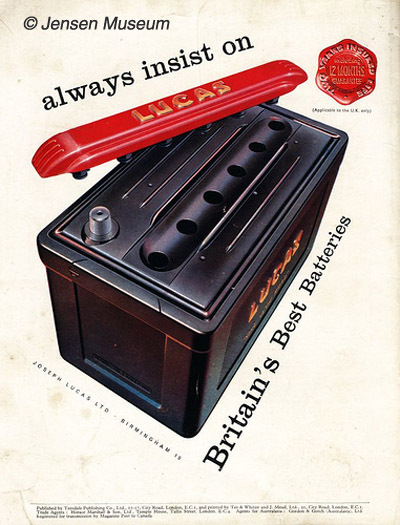 Lucas ‘S’ type battery advert from 1961. 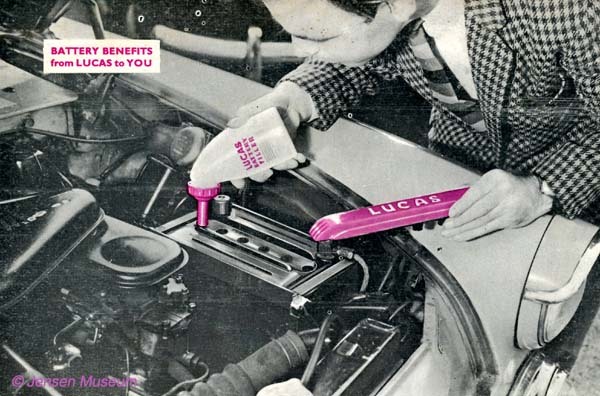 Lucas advert from 1963 showing the red plastic manifold top removed allowing the cells to be filled up. 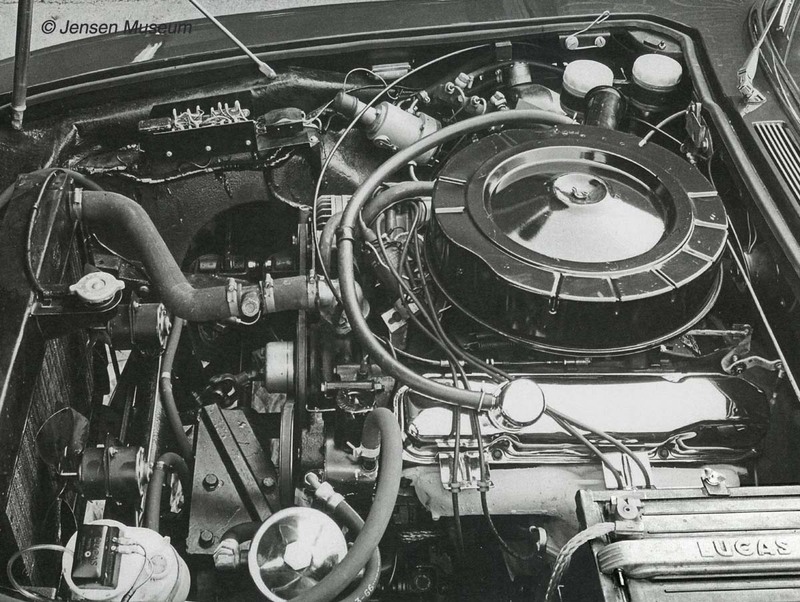 The engine-bay of the first Vignale built Jensen FF, chassis number 119/001, photographed in 1966. 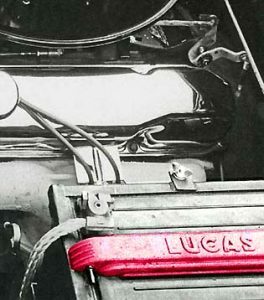 The Lucas ‘S’ type battery with Lucas branded manifold cap can be clearly seen. The Lucas ‘S’ type battery fitted to Jensen FF chassis number 119/025. This photograph was taken by motoring journalist, Michael Scarlett, during his trip to Switzerland with the car in 1968. 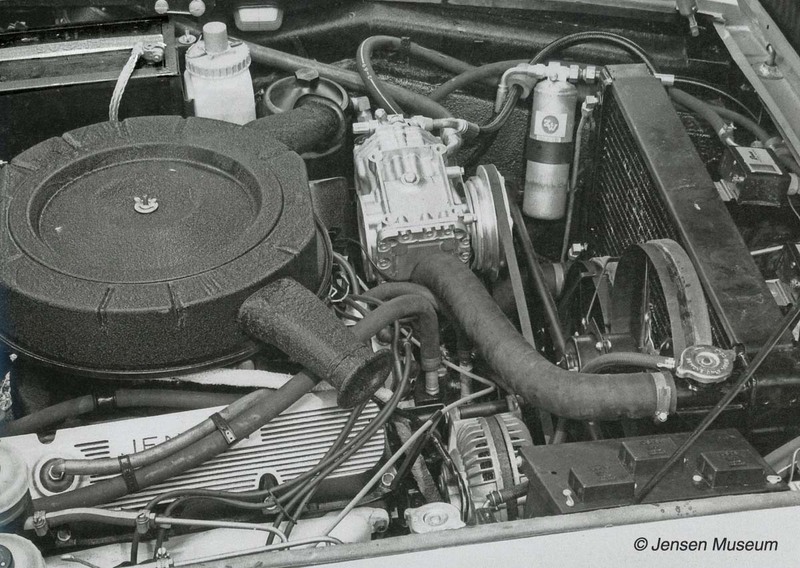 The Lucas ‘S’ type battery fitted to the experimental Mk.II Jensen Interceptor of 1969. 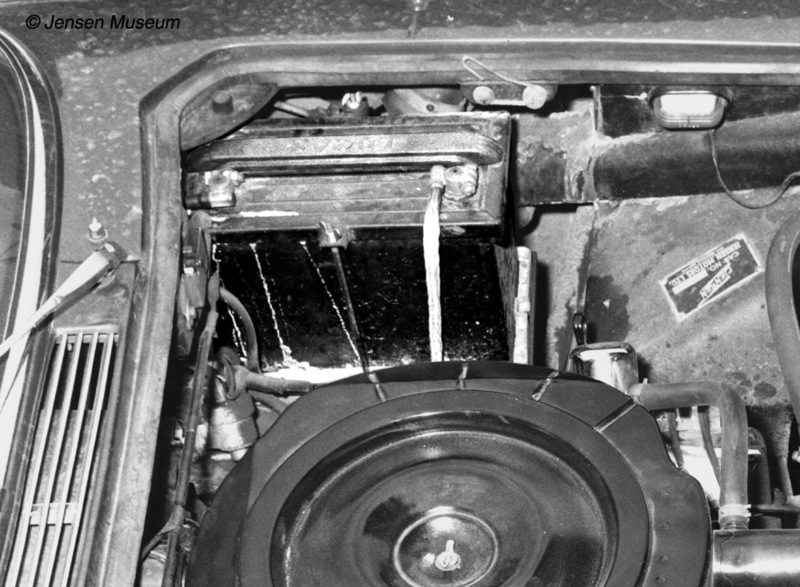 Typically, the life of a battery is finite, so unlike many items, such as a car radio which might be relegated to the attic , the humble battery would be discarded at the end of its life. The Museum is looking into replicating the Lucas ‘S’ battery, perhaps by modifying a modern battery. However, so far an original ‘S’ type battery hasn’t become available. If anyone has one of these batteries left in a garage please let us know.